The Blue Porch Bed and Breakfast : Brooklyn Life, New York Life. 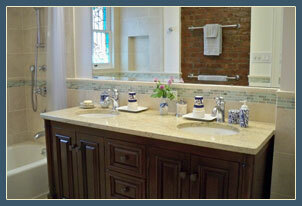 The Blue Porch Bed and Breakfast is located in Victorian Brooklyn, New York City. 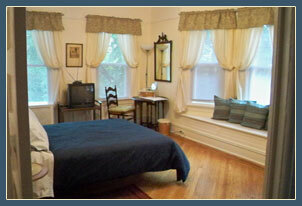 The Blue Porch Bed and Breakfast is owner occupied and run in a home built in 1904 in Victorian Brooklyn. Our two bright and airy guestrooms are located on the second floor. 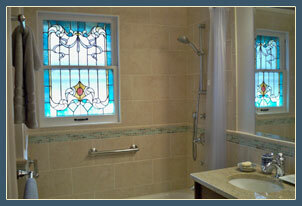 The bathroom is private for you whether you reserve one or both bedrooms. We accommodate up to two guests at the same time. The rate for one room -- single or double occupancy (using the same bed) -- is $150 per night. With New York State and City taxes (14.75%) and hotel room occupancy tax ($3.50 per night), this amounts to a total of $175.63 per night. 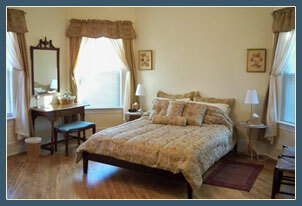 When you reserve both rooms for single occupancy in each room, the rate is $125 per night plus taxes for each room. With New York State and City taxes (14.75%) and hotel room occupancy tax ($3.50 per room per night), this amounts to $146.94 per room per night. Please inquire about our discount and deposit policy for stays of seven nights or longer. Deposits can be made by a personal or business check drawn on a U.S. bank, by Travelers Checks, or in cash. Checks and Travelers Checks should be made out to The Blue Porch Bed and Breakfast. If you do not have a U.S. bank account, we will accept your deposit via Visa, MasterCard, Discover, or American Express credit card. The remainder is due when you check in, and can be paid by a personal or business check drawn on a U.S. bank, by Travelers Checks, or in cash. For single-occupancy reservations, if we have availability you can arrange for a friend or relative to share your room for one or more of the nights you will be with us. This person must be arranged for with us when you make your reservation. There is a one-time $25 charge to set up a twin-size Aerobed in your room. For each room, a deposit equal to one night's stay (including taxes) is required to secure a reservation. This deposit is applied to the last night of the stay. The balance is due when you arrive. Check-in time is typically between 4 p.m. and 8 p.m.; check-out by 11 a.m. While you are making your reservations, please let us know if you need to arrive earlier or later. Please contact us one week before your arrival to arrange a specific check-in time. There is no smoking or lighting candles or burning incense anywhere on property, inside or out. We have a 14-day cancellation period. Reservations canceled between 14 and 8 days prior to the arrival date will be charged for one night' s stay. There is an additional $40 processing fee for each room cancelled. Reservations canceled 8 or fewer days prior to arrival date will be charged for the entire reserved stay. There are no refunds for shortened stays. Reservations may not be transferred to other persons without permission from us at least one week in advance of the arrival date. A Continental Breakfast of croissants or muffins, butter, cream cheese, jams, hot and cold cereals, fresh fruit, juice, coffee, and tea is set out in our dining room from 7:30 to 10:30 a.m. Please let us know in advance if you require an earlier breakfast, and we will do our best to accommodate your schedule. Guests with their own laptop computer and a properly configured wireless network card will be able to access our wireless network to connect to the Internet. Internet connection is not guaranteed. We do not provide computer support or offer our guests the use of our own computers. Free on-street parking is available. The days and hours of the alternate-side parking rules vary on different streets within our neighborhood, so please read the signs carefully.